What is urological robotic surgery? In urological surgery, fine motions are needed to delicately preserve neurovascular bundles and reconstruct the urinary tract to ensure continence. Robotic surgery allows for this precision by using instruments that give the surgeon a tremendous range of motion, accuracy and precision. Specifically, EndoWrist® instruments are designed with seven degrees of motion that mimic the motions of the human hand and wrist. Robotic surgery is performed using several small incisions, each about 1 cm in size. For most patients, robotic surgery through these small incisions offers less pain, a shorter recovery and improved cosmetic results. Robotic surgery also has the advantage of less blood loss and reduced need for blood transfusion, particularly during prostate and bladder cancer surgery. 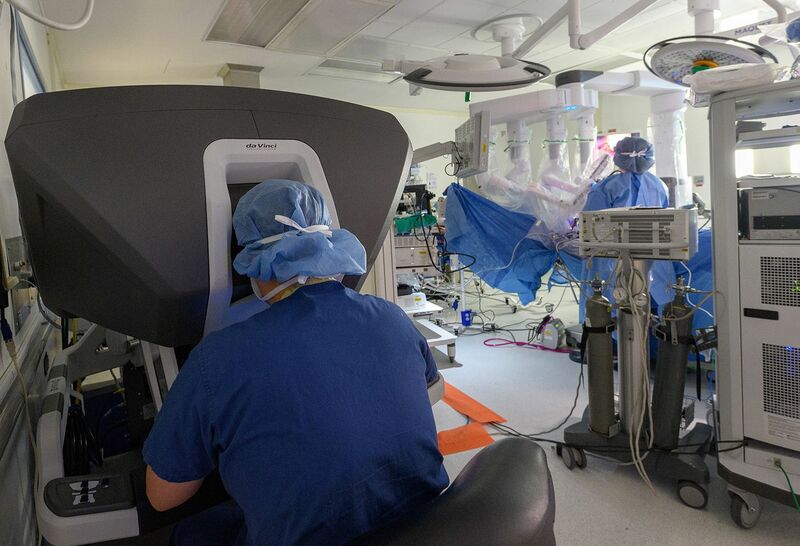 At the Smith Institute for Urology at Northwell Health, we use the state-of-the-art da Vinci® Surgical System, which consists of two key components: an ergonomically designed surgeon's console and the patient-side cart. The surgeon sits at the console and operates by manipulating master controls while the patient sits in the cart, which consists of four robotic arms with a wide range of surgical instruments. The system essentially eliminates tremors and maximizes dexterity, precision and control, allowing the surgeon's hand movements to be scaled, filtered and translated in real time into precise movements of the instruments within the patient. We also use the InSite Vision System, a unique system that allows our surgeons to see with 3D vision. The 3D endoscope and image processing equipment provides a detailed view of the operative field that further assists the surgeon in delicate maneuvers, such as nerve-sparing during prostatectomy and cystectomy. We strive to reduce the hospital stay, pain and scarring associated with surgery, and offer faster recovery, quicker return to normal activities, and improved functional outcomes. With each operation we perform, our goal is to optimize the three critical and inter-related aspects of urologic oncologic surgery: cancer control, urinary function and sexual function.